In this episode, I am talking to Todd Breen of Virtually Incredible about how to spend less time leasing to make more money and grow your business. Todd manages a property management company and opened an outsourcing solution called Virtually Incredible. It was designed to help property managers spend less time leasing and spend money on a good marketing campaign, business development manager (BDM), and call center to begin the customer journey on the right foot. [02:27] Business owners devote too much time and resources to leasing properties. [02:47] Putting less effort into leasing and more into listing can free up energy to grow your company. [03:54] Analyze and monetize your leasing process. [04:33] What would a customer’s experience be with your company and what do you need to do to improve? [05:00] Using the traditional model, business owners tend to charge an owner a tenant placement fee and share some of that with a commissioned leasing agent. [05:51] The traditional model is inefficient and expensive. [06:41] If answering a call isn’t your top priority, and booking/showing isn’t something you enjoy doing, then learn how to efficiently monetize leasing calls or inquiries. [07:17] Utilize mystery shopping to gain data about your customer’s journey. [09:05] Companies do not grow because they’re not answering their phones, or they’re preoccupied when they do. [09:19] Specialize your outsourcings and upgrade your technology for your showing process to devote more energy to answering new owner calls. [10:33] Employees who answer your leasing lines should be Fair Housing trained and certified to properly respond to questions. [11:45] The most significant benefits to offloading leasing calls include a quiet office. [13:26] Be good at hiring, training, supervising, managing, and motivating staff. [14:33] Look at how much it costs you to lease a house. Add up commissions, staff hours to answer phones, mileage expenses, and hours spent showing houses. [15:05] Do the same analysis on your customer acquisition cost in getting a new customer to manage their house. [15:38] Are you doing your best job leasing? Can you improve that to free up time and resources to grow your business? [17:42] Cut the number of days to market to rent faster, do a great job renting, and have higher client retention. [18:35] Staff that complies with Fair Housing lowers legal liability and provides a greater peace of mind as a business owner. [19:23] Don’t be afraid to outsource tasks to an outside team. [20:32] Answer after-hours calls to increase your efficiency and reduce days on the market. [22:10] Whatever you’re spending in money on leasing, spent that on marketing for new owners and hiring a BDM. Reallocate funds toward growing your business. [22:52] You should have software to facilitate calls and showings, such as Tenant Turner, Rently, ShowMojo, or Mock Rentals. [23:55] Make sure the call center you select is as good as you hoped. Get a dedicated leasing hotline. [25:22] Publish your rental standards in each rental listing. Describe what is needed to rent from you. [27:24] Have leasing agents who have the listings, but also a leasing director that serves as the leader. [29:00] People who are 35 and younger don’t call. They book their showing online. If you don’t have an online showing option, get one. [29:45] There’s got to be a way to reach out to the people who want customer service and a way to reach out to people who want technology. [30:21] Shift your focus, time, energy, resources, and staff toward growing your business. [30:58] Utilize videos to accelerate your marketing process, reduce your days on market, reduce phone calls, and reduce your showings. Don’t be afraid to outsource tasks to an outside team. That’s the real benefit, spend less time leasing and more time listing. Reach out to people who want customer service and who want technology. 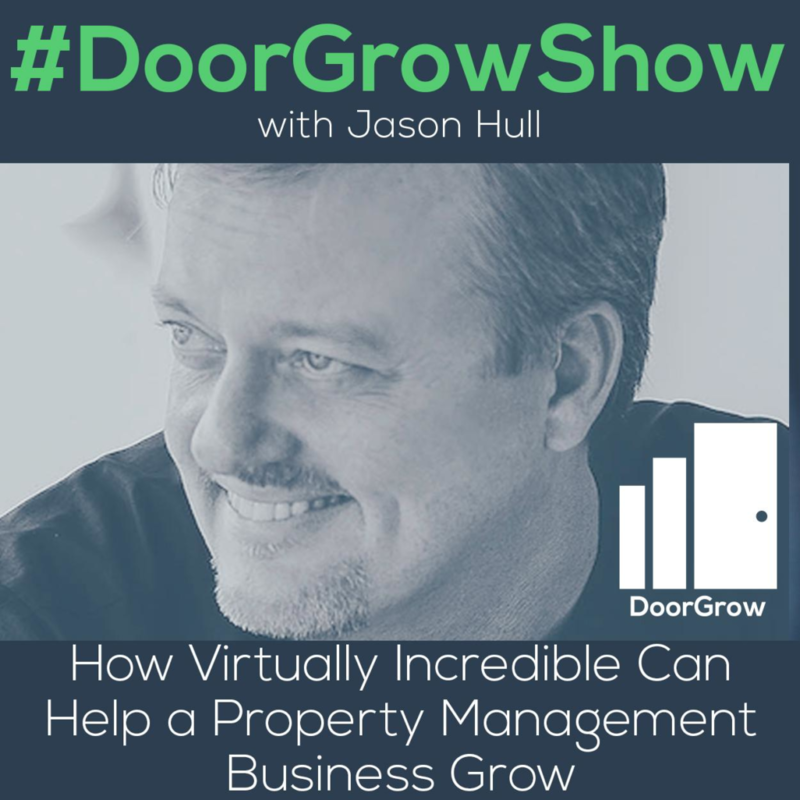 Jason: Welcome DoorGrow Hackers to The DoorGrowShow. If you are a property management entrepreneur that wants to add doors and expand your rent roll, and you are interested in growing your business and life, and you are open to doing things a bit differently then you are a DoorGrow Hacker. At DoorGrow, we are on a mission to grow property management businesses and their owners. We want to transform the industry, eliminate the BS, build awareness, expand the market, and help the best property managers win. If you enjoy this episode, do me a favor, open up iTunes, find The DoorGrow Show, subscribe, and then give us a real review. Thank you for helping us with that vision. I’m your host, property management growth hacker, Jason Hull, the founder of OpenPotion, GatherKudos, Thunder Local, and of course, DoorGrow. Now, let’s get into the show. I’m here hanging out with Todd Breen today of Virtually Incredible. We’re gonna be talking about how to spend less time leasing so that you can make more money and grow your business. Todd, welcome to the show. Todd: Thanks Jason, good to be here. Jason: Todd, give us a little bit of background on yourself and how you got started with Virtually Incredible. Then I have a bunch of questions that I want to ask you to really dig into this. Todd: I grew up in a real estate family and that put me into property management at the age of 21 because my dad had 55 rental homes. Managed property with the management company for years. About six or seven years ago, I decided to open an outsourcing solution and that outsourcing solution was designed to help property managers with things that I outsourced with. I’ve been scaling that, it’s Virtually Incredible. Still have my management company and it’s still fun hanging out with you and a lot of other property management company owners. Jason: Let’s talk about the problem that exists with leasing. What are some of the problems that business owners have in terms of growth relevant to leasing? Todd: It’s interesting. If you go to the average property management company, they devote an enormous amount of resources to leasing properties. In contrast, they devote very slim resources to answering the phone when an owner calls to sign up new listings. I decided that if we could do something to reverse that trend and put less effort into leasing, that we could put more into listing. It’s cool because a lot of the people who have done that have reported that fred up a lot of energy to begin growing their company. Jason: One of the big problems or challenges that they might have relevant to growth is they don’t have the BDM or somebody focused directly on sales. They themselves don’t have the time to focus as much on sales because they’re dealing with all this kind of stuff. Could you explain what the problem is with the traditional model and what that traditional model typically looks like? Todd: Yes, I’ve done this for 30 plus years. The average property management company has a leasing agent or two or some staff of leasing agents and they don’t have a BDM, a Business Development Manager. I’ve spoken on seven tours of Australia to a lot of Australian business property management company owners and they are just nubby about having a BDM. Guys with 50 or 100 doors, they’re starting out, they have a BDM because they know that if they do that, they’re gonna grow. One of the things that we’re done is we’ve really gone into the leasing process and analyzed it and then changed it. Let’s start with the analysis, do this in your head. For every hundred leasing calls and emails you get, how many leases do you write? If you’re like most companies, you’ll say, “Maybe one or two.” That’s 1% or 2% of your leasing increase, whether it’s an email or a phone call, that results in you monetizing that event. In contrast, how good a job are you doing at marketing your company and answering the phone and listing new business? If we called your business and mystery shopped you as a tenant trying to rent a house from you, or as an owner trying to lease with you, what would our experience be? Whatever that is should give you an idea of some areas that you could improve and restructure so that you spend less time leasing your house and more time listing houses. Jason: If traditional model has leasing agents, what’s the cost there that they’re spending on these agents typically? Todd: It varies by region but a lot of people are charging the owner a tenant placement fee and then sharing some of that with a leasing agent that’s commissioned. The result is they say, “Okay, you got to answer the phone calls and we’ll also have some of those phone calls going to the front desk.” Between a leasing agent who can only handle one call at a time, and then it goes to a front desk person who is not a leasing agent, they’re taking messages, or what happens more than we want to acknowledge, it goes to voicemail. Now you start the game of voicemail tell and tag. That’s the traditional model. Jason: Under the traditional model, it sounds like it’s just incredibly inefficient and expensive. In some instances, they’re probably giving up half of the fees that they’re getting on through the leasing process to a leasing agent. Todd: Yeah. I was a leasing agent and this is no joke. I had four kids growing up, varying ages, that would come along with me on showings and I was showing houses so much, I bought a high top conversion van in with the TV VCR in it so that I could bring my kids with me while I was showing. I was thinking to myself this isn’t a very good life for me or them. From a lifestyle standpoint, I was as efficient as I could be but it was really impacting my lifestyle. What are your leasing agents or you’re doing your own leasing, what’s your lifestyle like? If you’re struggling to get things done and answering a call isn’t your top priority and booking and showing isn’t something you’re excited to do and then getting the showings to happen isn’t something exciting, then welcome to property management. The fact that we monetize one out of a hundred leasing calls or inquiries. We could really do that more efficiently if we wanted to. Jason: The problem gets even worse because you had mentioned to me that only a small percentage are actually answering their leasing calls. Could you explain that? You did some mystery shopping. Todd: Because we have a deliverable we can give. We’ll call an office days, evenings, and weekends and just pose as a potential renter and let you know what response we get. The average results are that we’re answering the calls 60% during the business day and less than that evenings and weekends. Of course, when do people really call you the most to see a house? It’s evenings and weekends. If you’re gonna do a good job answering days, evenings, weekends, welcome to the 80 hour work week and you have no life. Jason: You had mentioned these really don’t make them money. It sounds like a lot of work but if only 1% or 2% are connected or actually coming on board, then 99% of them are just a complete financial waste of resource and time. We really don’t need thousands of people in our CRM. If that’s the case, better to just outsource that and focus your energy on growing your business. The same thing happens, we mystery shop management companies routinely to possess a potential landlord that wants to list with you. Many companies wonder why they’re not growing, it’s because they’re not answering those phones, or they’re just really super preoccupied when they do and it’s just not a really pleasant experience for potential landlord to call. We think that by specializing your outsourcings and upgrading your technology on some of your showing process, you can devote more energy to doing a bang up job answering new owner calls. Jason: What is the ratio typically of all the calls that are coming into a property management office that are leasing oriented? If these are the ones that aren’t really making you money. Todd: That number is somewhere around 70%. Jason: The majority, the vast majority of the phone calls they’re getting are leasing related and are not connected to getting new business, not connected to owners. Jason: And not making money. Todd: Because you’re only monetizing 1% or 2% of those leasing calls or emails. Jason: Those really are the garbage of phone calls. Jason: Yeah. That can really damage reputation if you’re not doing a good job. To make this even deeper, you had mentioned that there is a legal issue here as well potentially. Todd: Does everybody who answers your leasing lines, have they been Fair Housing trained and certified, do they know how to respond to the questions that could get you in trouble? If that hasn’t been scripted, and trained, and the people haven’t been certified, if you’re not doing the assurance where you randomly listen to their calls, how do you know that’s being handled properly? We’ve got call center, we actually do what I just said. I’ll be honest with you, as a broker, owner of a management company for 33 years, it wasn’t until I started a call center that I knew that my calls were being answered consistently according to best practices in Fair Housing. Jason: Yeah. There’s a little bit of danger there in creating a perception of discrimination, or not getting back to certain people and then, “You didn’t do it because I’m this type of person probably,” etc. Jason: Just by not having a consistency, it can create the perception of that problem. Let’s get into the reason behind this, the benefits. What are some of the most significant benefits to off loading these leasing calls? Jason: I found in business, if I can lower the pressure on noise that an entrepreneur, or business owner experiences, their best attributes start to come out. I’ve seen it in my own business, the more I can lower the pressure noise that is around me, the more supported I feel and the more my best attributes come out. But entrepreneurs, when we’re in a place of high pressure and noise, all of these crazy attributes come out that are the worst of humanity. We’re called ADHD, and we’re called stressed, and like high octane, and we’re just frantic. Todd: If you think about it, we’re all professionals. When somebody calls you without a pen, without a pad, they have no way to write down data that you’re gonna give them and then they say, “I’m calling about the house with a red door.” You’re trying to get something done to slay the dragon that day. That creates a frustration level that can reach up a high point sometimes. You’re right, it does bring out some of the worst in us. Jason: Another benefit we have discussed is not having to hire agents or far fewer agents where you’re out commissions, can you touch on that briefly? Todd: You’re a business owner, I’m a business owner and unless you’re a business of one, then you have to be good at hiring, training, supervising, managing, motivating staff. Also you got to pay them well, or they’re not gonna stick around and you wonder how they’re gonna represent you. Anything that we can do hand that off to somebody who’s capable or confident frees up some energy, some time, some resources for us to just do the magic we do. I personally don’t enjoy hiring agents. To me, that’s all challenge. You wonder are you gonna work hard, you’re gonna respond to phone calls, and the new models for how to lease houses in many cases require little to no direct agent interaction. Jason: Why would somebody want to do this, besides those things? Todd: We talked about spend less time leasing and more time listing. If you could look at how much it costs you to lease a house, when you add up commissions, staffs hour to answer phones, any mileage expenses for time it takes you to drive, your hours of work showing houses. If you could do all of that added up and say, “Okay, I did six leases this month and I spent this much money so it cost me this much per lease.” Then, do that same analysis on what’s your customer acquisition cost in getting a new customer here that you can manage their house. Where would you rather invest your money? I’ve been tuned into the DoorGrow Show for a long time and I’m seeing over and over again people saying, “He-ha, I did a seed hacker and it took time but all of a sudden, wow look at this man. The rain is coming.” But that comes because they devote time and money and energy to the seed hacker. That’s the rug, are you doing your best job leasing, most of us would say, “Maybe not.” Can we improve that and then to free up time and resources to grow our business. That’s the real benefit, spend less time leasing and more time listing. Jason: How can property managers turn this then into a unique differentiator or selling point for their business? He was like, “Did we say that? Yeah, we’ll change that script.” But when you say to somebody who’s got a vacant house, “Hey, mystery shop us and mystery shop anyone else you’re considering listing with. See how easy it is to see a house with us compared to some of these other people you can list with.” Usually that’s all you have to say, they’re not even gonna spend the time mystery shopping and no one else is gonna throw that challenge to them. That’s just a huge way to turn this into a point of difference that will get you more listings. Todd: When we tell you that our days in market are 13 days and the average in the industry is 22, now you understand why list with us. Jason: Let’s touch on that benefit. You’re cutting the days to market then by what percentage typically? Todd: If you take a normal market with the traditional model and you say, “Okay, we’re putting showing software into place and we’re putting call center and we’re answering 80 hours.” We can see routinely between 25% and 50% reduction in days on market. Jason: Which means you’re gonna have higher client retention, that’s a big deal to them. You had mentioned fast releasing times and you’re gonna keep more of those owners when things get rented and money is coming in. Jason: Another thing you touched on before is a problem, potentially Fair Housing, having compliant staff, lowering the legal liability, the benefit of that is getting greater peace of mind as a business owner. Todd: That’s part of the reason why I outsourced my leasing calls, that’s part of the reason why I outsource my tenant screening because you don’t typically get Fair Housing complaints from leased units, you get it from your vacants and the leasing process. I set up a team that manages our tenant screening and they do a great job, we do it for upwards of a hundred other companies and it just really makes me feel good knowing that every application gets treated uniformly. Jason: Relevant to that, a lot of people might have this fear of handling things to an outside team. Sometimes, business owners, we’re control freaks. We feel like if the staff’s not there that I could touch them, hear what they’re doing, talk to them. It might be bad, sick, or wrong somehow. What’s the flip side of that? What’s the advantage then when it comes to staffing issues or not having this stuff handled by a team such as yours, as opposed to having one person or two people in your office that are doing this? Todd: If that person is sick, then your work staff is cut by 50% or 100%. If that person is on vacation, if that person is having lunch or on their break or just can’t get to the phone or if they’re on the phone, how do you expand your bandwidth to handle three or four simultaneous calls and do a good job? We got all of that nailed down, we rent stuff pretty quickly as a result and we hear that from people routinely. Yeah, stuff rents quickly. Just makes you feel better, we’re doing a great job. Jason: What’s the percentage typically do you find of calls that are outside of their normal business hours then? Todd: It’s really something, if you don’t advertise ‘call our leasing hotline’ which means you have a leasing hotline. You get all your calls off of your main line and get a leasing hotline. If you say, “Call our leasing hotline days, evenings, and weekends. We answer.” If you advertise the hours that you answer, you’re gonna start to see that people who are flipping through vacancies and they see, “Oh my god they claimed to answer their phone at [7:30]PM, I’m calling them and booking an appointment.” If you do that, you’re gonna see an increase in after hours calls which increases your efficiency and reduces days on market. Jason: The after hours calls actually increase and the day time calls actually decrease when people see that they can route the flow of that traffic, that direction. Todd: I want you to just think back to the last time you moved and what it was like trying to call and get people to answer your call, answer your questions, and book a showing for you. That is typically one of the worst experiences that the consumer has. When you go out of your way to say, “We answer. We got a call center. We’re ready for you. We do this.” You just begin the customer journey on the right foot. Jason: Anything else you think of, benefits, or reasons why people should consider this? Otherwise, let’s get into how. Todd: The biggest benefit is whatever you’re spending in money on leasing, can you imagine if you spent that on marketing for new owners and possibly even hiring a Business Development Manager? Depending on the size of your business, that’s an entirely realistic way to go. Jason: Right. You can re-allocate those funds towards something that can actually help you grow your business instead of just providing fulfillment. Let’s get into how this happens. What process might be, I think there’s a few step that need to exist in order to leverage and properly use a team like yours. Where does somebody start? Todd: If somebody calls us up and says, “Will you answer our leasing lines?” We’re gonna say, “What showing software do you use?” If they say, “We don’t know if we need it.” Then we turn around and say, “We’re gonna do you a favor, we’re not gonna answer your leasing calls until you get one.” Because you’re gonna reduce your number of calls with a call center but that showing software, the Tenant Turner company out there that will give you the software where tenant can book their showing online, that’s gonna change your call volumes by around 50%. Jason: Okay. We’ve got Tenant Turner, Rently, ShowMojo, maybe even Mock Rentals or some system that can facilitate that. They need some sort of software. Todd: Check with your software provider, if you have Buildium I know they just did a deep integration with Tenant Turner. That would be the natural one for you to look into. Whatever your software is, it’s important that you get showing software and then you get a call center such as the one Virtually Incredible offers, a good call center. It’s important that you call them before you go up forward and you do the due diligence. Because if you’re getting people on the other side of the phone that aren’t answering the calls well, then you really haven’t improved. Do your due diligence, and that’s been one of our strengths. We’ll give you a list of some people to call and we’ll say, “Hey, try mystery shopping any of these companies and see how we do.” That typically closes the deal for us. First thing you do is get software. Second thing you do is make sure the call center you select is actually as good as you hoped that they should be. Then you get a dedicated leasing hotline in the process. Some people choose not to do this and that’s fine if they have all their signs with their main number published. But hopefully you’ve got an auto attendant that answers your main line. It could say, “Hey, you’ve reached ABC realty. Press 1 to speak with our leasing staff about our properties available to rent, all other callers stay on the line.” Those can then bypass your frontdesk or your staff. That’s typically it. We just went ahead and published our rental standards in each rental listing in the remarks section. Our final paragraph is this is what you will need to rent from us. By doing that, we tracked a 10% drop in our call volume. Todd: I thought that works. We saved everybody some time. Jason: Just by adding all of your criteria for being a rental applicant to the bottom of each listing description. Todd: That’s just a huge transparent factor. If you put it there, then make sure you follow it. It’s a great way to save some time, some money. Jason: Great tip. Any other tips? That’s what I would recommend you do is start thinking about okay, would this person make a good BDM? Or could I transition this person into a property manager? The new model is not to have leasing agents that have the listings but have a leasing director that basically is the orchestra leader. The leasing director’s role is they coordinate the okay, you’re approved conditionally, we’re sending you the lease on DocuSign. You need somebody who can move the parts around at that stage. Typically, that’s not somebody that has to earn a huge commission for that task. Jason: Got it. That’s a job. Generally, if you’re gonna have commission paid staff, they need to have a direct impact on the outcome because then the commission could motivate them to do the outcome. But that’s typically people that are pretty highly driven personalities, but support related staff that are typically more in the systems, process, they want safety and certainty. They’re like the opposite of us crazy entrepreneurs. They want a job and they want stability. Usually those kind of high percentages, they don’t motivate them any differently. In fact, I find that my staff, they far more feel rewarded in some instances if I believe in them and I notice that they’re doing a good job as opposed to just threw more money at them. In fact, there’s no amount of money you could throw at somebody if they feel that the business owner doesn’t like them or they’re not doing a good job. Todd: The simple truth of the matter is that this device changed the world. I’m 54, I think you’re about 15 years younger. Jason: For those listening, he’s holding up his cellphone. You’re not gonna get me if you don’t answer the phone. There’s got to be a way to reach out to the people who want customer service and there’s got to be a way to reach out to people who want technology. Todd: They’re awesome if you answer the phone. Todd: You just got to answer the phone. Jason: Awesome. Todd, this all sounds really great and it makes a lot of sense for property managers so that you can shift your focus and your time, energy, resources, and staff towards growing the business away from the garbage of phone calls and being handled and do this in a way that really makes your company look even better. How does somebody get in touch or get started with Todd Breen and Virtually Incredible? How do they connect with you guys? Todd: Well, you could give us a phone and we might actually answer the call if you called our phone. You could also send an email to sales@virtuallyincredible.com and we’d be happy to follow up with you. We also have another way to spend less time leasing, that I’d love to just spend two minutes sharing. Todd: You’re the guy that understands content marketing. One of the best content that we can put out as a business owner is a video. If you’ve ever thought about how to reduce your showings from 5 or 10, just take a minute and think how many times do we show each listing before it rents. Just put a showing on YouTube. Walk through the property and show it. We found that reduces days on market, number of calls, because once somebody’s seen a video walk through tour and they call you, they want to rent the house. They’ll often times meet you in the front yard and say, “If it looks anything like the video, we’re gonna take it.” That’s a great way to accelerate your marketing process, reduce your days on market, reduce phone calls, reduce your showings. It’s a great efficiency tool. We’ve got training on virtuallyincredible.com that’ll teach you how to do that. That’ll reduce your call center bill if you use that training and get these video walkthrough tours. We can also put a virtual tour up for you, we’d be happy to tell you more about that. Jason: Awesome. Yeah, great tip. Including video generally speeds up any sales process or conversion rates on just about any websites, that’s a no brainer, love it. Cool, anything else that everybody should know? Todd: Yeah. Spend less time leasing and get some money spent on a good marketing campaign to grow your business and get a BDM that would really help you grow things. That’s the direction we’re headed in and we’ve helped a lot of people do that. Jason: Awesome, Todd. Appreciate you coming out on the show. Hope some people reach out to you, Virtually Incredible, how you guys handle it. I’ve heard fantastic feedback inside the DoorGrow Club. Those who are listening, if you want to check them out or vet them, you can ask around inside the DoorGrow Club, just go to doorgrowclub.com. I’m hearing nothing but praise. Kudos to you and your team, Todd. Todd: Yeah, I got couple questions here. One guy says that I look like I’ve lost weight and another guy says do I have any fishing tips. Apparently, we’ve got some fun people watching the show today. Jason: Cool. They can connect with you also inside the DoorGrow Club as well or connect on Facebook. Todd: If you’re in Florida and you want to go fishing, look me up. I’d love to go out with you anytime. Jason: Awesome, cool. Todd, thanks again for coming out on the DoorGrow Show, appreciate it. Todd: Thanks for having me, take care. Listen, everyone is doing the same stuff, SEO, PPC, pay per lead, content, social direct mail, and they still struggle to grow. At DoorGrow, we solve your biggest challenge getting deals and growing your business. Find out more at doorgrow.com. Find any show notes or links from today’s episode on our blog at doorgrow.com and to get notified of future events and news, subscribe to our newsletter at doorgrow.com/subscribe. Until next time, take what you learned and start Door Grow hacking your business and your life.